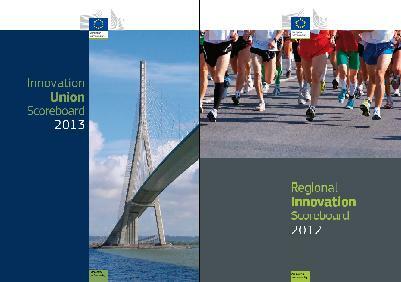 and secondly the 2012 Regional Innovation Scoreboard (download here) which attempts albeit with fewer datasets to look at innovation performance within regions across the EU. So what does this show for the, EU, the UK and more specifically for the West Midlands. Firstly it is probably worthwhile describing briefly what both documents attempt to do. They in effect piece together different sources of information to produce an overall index of innovation. There will be those amongst you who might wish to discuss the merits of the variables included and also the method of combining them into a single index. That discussion is however for elsewhere; this blog post takes these as read and looks at what these indices are telling us. It uses this data to place countries and regions into a series of broad descriptors which portray the level of innovativeness of the Country/Region. It classifies countries and regions into four broad categories which are subdivided into three …making twelve categories in total. 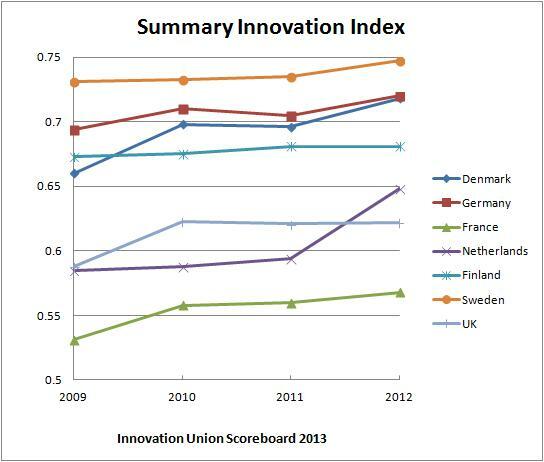 The EU is closing the innovation gap on many other countries e.g. the US and Japan even in the current economic crisis. 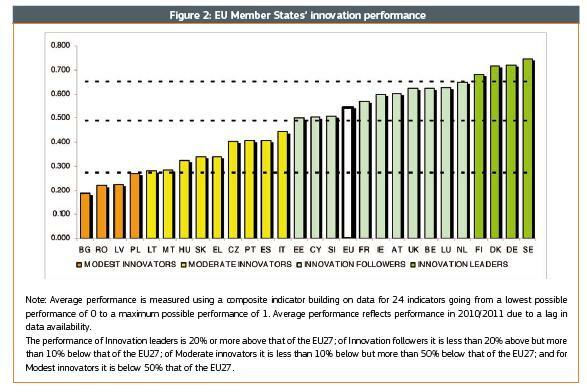 Within the EU however, after many years of convergence in Innovation performance, there is a reverse in this trend with the leading countries pulling away from the less innovative countries. However the UK as the graph below shows has fallen back slightly in relative and absolute terms; most other leading countries have performed better since 2010 and many are pulling away from the UK. It is perhaps coincidental but the slip in UK performance coincides with the closing of England’s Regional Development Agencies. 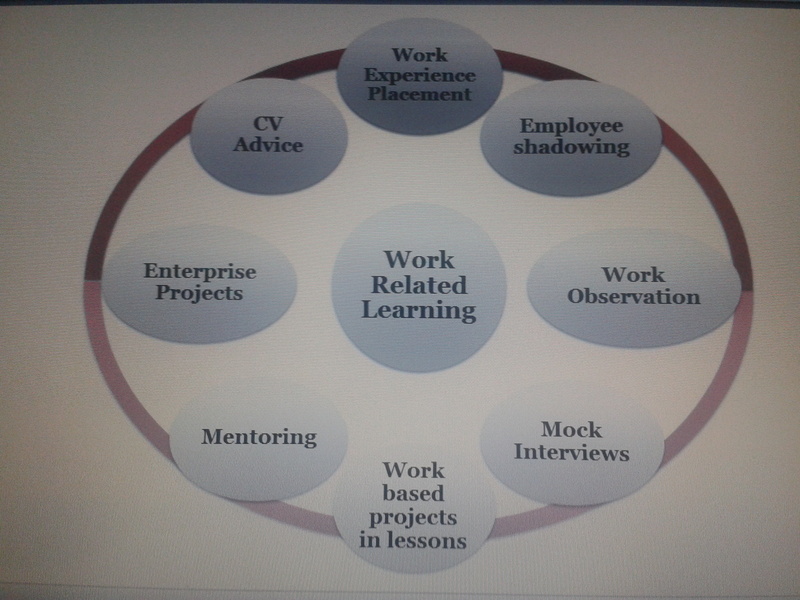 The RDA’s used to be well resourced to lead on promoting innovation at regional level in England. What do the figures say for the West Midlands and UK Regions? The West Midlands’ performance has slipped back. 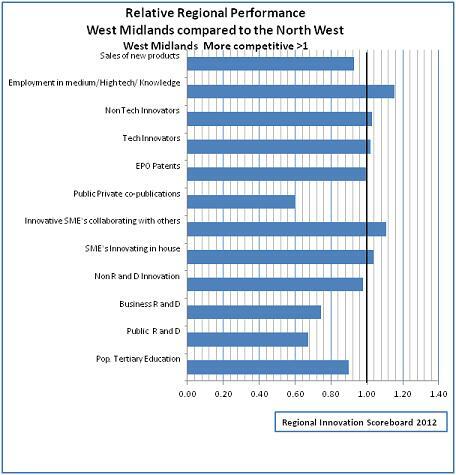 In 2007 the West Midlands was an Innovation follower medium but now is an Innovation follower low. Given the range of statistics available it is hard to pick out exactly why the region has been downgraded. Two key factors may explain it; the share of employment in medium/high tech manufacturing and the knowledge sector relative to other regions has fallen significantly in the West Midlands and secondly and similarly the sales of new products. It is interesting to compare the West Midlands absolute position compared to a geographically close comparator region. In comparing the West Midlands with the North West – a more highly rated region (which is an innovation follower high) the clear difference lies in two key factors. The West Midlands has significantly less public and private R and D expenditure and whilst the West Midlands marginally leads on a number of factors it is this lack of investment that is pulling the region down. What is also interesting is the two tier nature of the UK with the South East and the East of England being deemed to be Innovation Leaders significantly in front of other regions. The chart below looks at the positions over time and it is clear that the recession hit most regions but what is equally clear is that whereas with many other regions there has been a bounce back; that is yet to happen in the West Midlands. The West Midlands and the North East are now the two lowest English regions. There are a number of implications from these figures. It is clear that the UK could be an Innovation Leader if it could increase performance outside the hot spots of the East of England and the South East. The Technology Strategy Board’s Business Innovation Strategy (download here), whilst being highly valued has no geography at all in it. Therefore one lesson from these statistics is that Innovation should not solely be run nationally; it needs to add on a regional and local level and therefore it is welcome that the UK Government is planning for the new EU funds in England to be largely steered at LEP level. A significant portion of these funds either directly or indirectly will focus on Innovation. 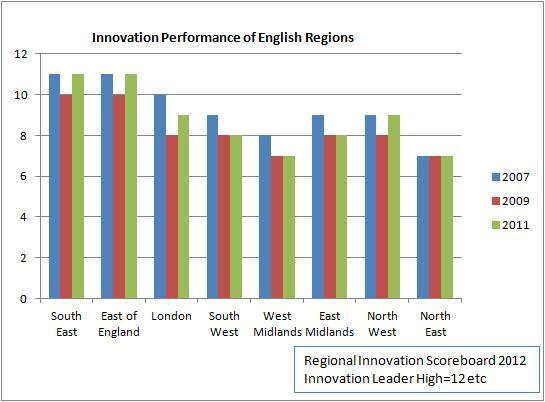 The West Midlands obviously has an issue with innovation and doesn’t perform as well as it could. It will be important to ensure that these EU (and single pot) resources are spent wisely; that LEP strategies on Innovation and sector/cluster development are not drawn up in isolation. The good work of Birmingham Science City and West Midlands European Service in seeking to develop such coherence is to be welcome. There is also a real need to more fully understand our strengths and weaknesses and to draw up co-ordinated actions to target barriers. So for instance why is it that the North West gets more public and private R and D expenditure – we need to delve deeper! Greater thought also needs to be focussed on what other countries and regions do well. So transnational projects like Making Knowledge Work, Science Park Without Walls , Cross Innovation and the fairly recently announced Complex Challenges, Innovative Cities project amongst a large number of such projects are important; but we need to collectively draw out, discuss and importantly publicise the lessons from these. There needs to be a forum and a drive for such open and honest discussions. There is also a need to build on and exploit our strengths such as the network of Science Parks and our many Universities. David Hardman (CEO of Birmingham Science Park) in a blog post last year indicated there was a need for greater joining up in the innovation infrastructure in Birmingham and the West Midlands. Given the lack of performance as evidenced by these reports this seems a valid viewpoint. There is a real need for a step change in the approach to innovation in the West Midlands. To deliver this therefore the LEPs clearly need to work closely together and Birmingham Science City should play a leading role in this.